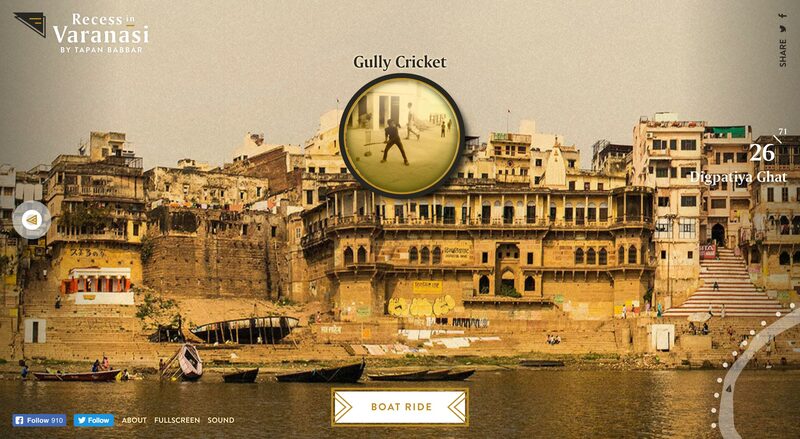 Wonderful, interactive One Pager by Tapan Babbar where he takes us up the river Ganges to explore the sights and sounds of Varanasi, India. Each stop has a video of the games he played with the locals, really capturing the mood of the location. Lovely touch allowing visitors to choose row or motor as their journey preference:) Make sure you see Tapan’s other excellent work we’ve featured in the past. Of late I have been feeling nostalgic about the street games we played as kids. In Varanasi, where smartphones are yet to add quality to people's lives, one can still find children playing outdoors. I had a great time while documenting some of those games, and playing them too. The photographs I took on a 5 km long boat ride were stitched together into a giant panorama. This panorama was linked with an interactive map of the river Ganges, and was used as a navigation to view the different games.